Twenty One Pilots. We think. Jack Kerouac said that. But if he’d lived long enough to hear James Hetfield bellowing ‘I am the table’ on Metallica/Lou Reed’s The View, Jack would see that among the riffs, there’s always going to be a few porkies. Here are six new songs which will never tell a lie and hurt you. 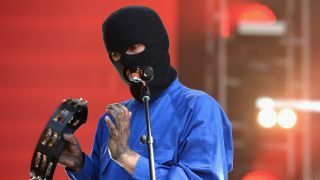 Since releasing their fourth album, Blurryface, this Ohio alternative rock/hip-hop crossover duo have exploded everywhere, much like a pot of yoghurt left on a hot radiator. Here’s a video following them from backstage until they reach a hysterical, sold-out crowd. No yoghurt to be seen anywhere. With the release of their self-titled fourth album last year, Michigan metalcore types We Came As Romans further shed that label with their most radio friendly collection of songs to date. If that’s a blow for the metalcore purists out there, it shouldn’t be – songs like Memories are full of hooks and soaring choruses. Just want to hear guttural screaming? Go and look out of the window at that couple who are in noisy disagreement about something or other. Propelled by an insistent hook, vocals that are somewhere between Billy Bragg and Nick Cave, and lyrics that reek of despair, this track by Sean Grant & The Wolfgang is a dark-yet-enticing affair. Taken from the Northampton/Milton Keynes four-piece’s new EP, 7 Deadly 7, it’s a brilliant slab of doom-laden, nihilistic rock’n’roll that’s hard to shake once you’ve heard it. A bit like a dog with its teeth in your leg. For their new single, this Canterbury quartet have served up a parody video which features an updated (and presumably English) version of a typical American nuclear family. Honey is an immediately catchy, uplifting song that would be perfect to soundtrack the impending summer. If Britain is ever treated to such a thing. We’d kill for some Vitamin D right now. Former Nightwish singer Tarja Turunen has travelled back in time – to somewhere between the 1970s and ’80s, by the looks of it – in this video for her new song, No Bitter End. Taken from The Brightest Void, a nine-track prequel record to forthcoming album The Shadow Self, it finds Tarja – and her distinctive vocals – on fine, warble-powered form. It took Cambridge rockers Lonely The Brave a long time to release their first album, but it was definitely worth the wait. Thankfully, the five-piece have quickened the pace for its follow-up, Things Will Matter, but Rattlesnakes is proof positive that they haven’t knocked out any old guff in a hurry. Which is good.